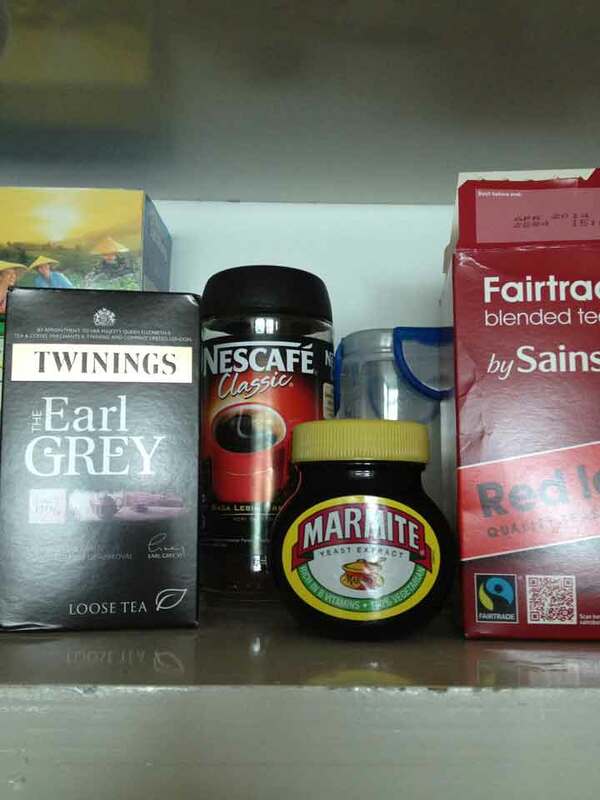 I’ve always thought it most bizarre that British people, when traveling outside of their sceptered isle, are given to filling their suitcases with things like PG Tips, Marmite, baked beans, and marmalade. You’d think that one of the greatest thrills of traveling and going on holiday is to sample the delights of the country that you are visiting. It may not always be to ones taste, and it may be a bit ‘foreign’ ‘fancy’ and ‘different’ but that’s all part and parcel of ones travel experience surely? For some people, just moving to different parts of the UK can strike fear into their culinary hearts. Take Irishman’s Father for example. 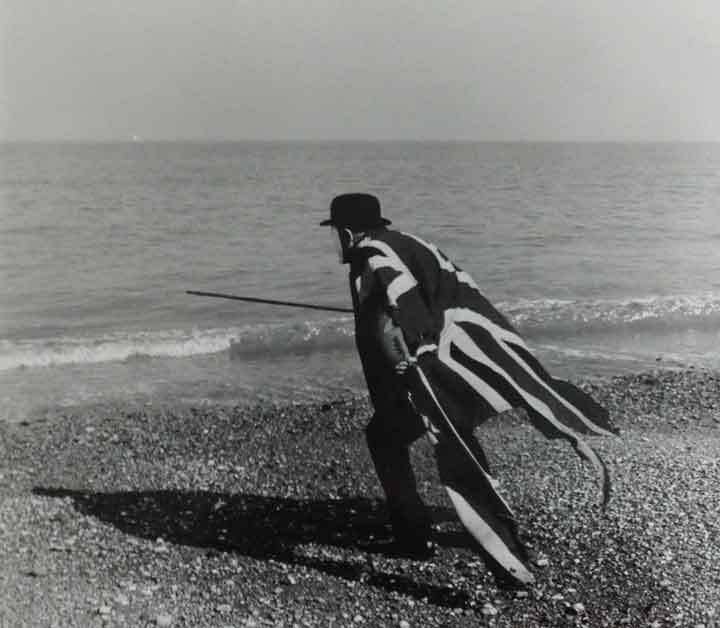 He moved for a period to the Isle of Wight and despite the fact that it is only 3 miles from the mainland, he was so convinced that he wouldn’t be able to find any marmalade there, that he took an entire suitcase of the stuff over with him lest he ran out of his favourite orange preserve. Many moons ago, when I moved from Suffolk in the S.E of England, up to North Yorkshire, a concerned friend asked if I’d still be able to buy red peppers and aubergines – don’t laugh, she was being serious! Not convinced, the first time she visited us, she came armed with a carrier bag full of them. 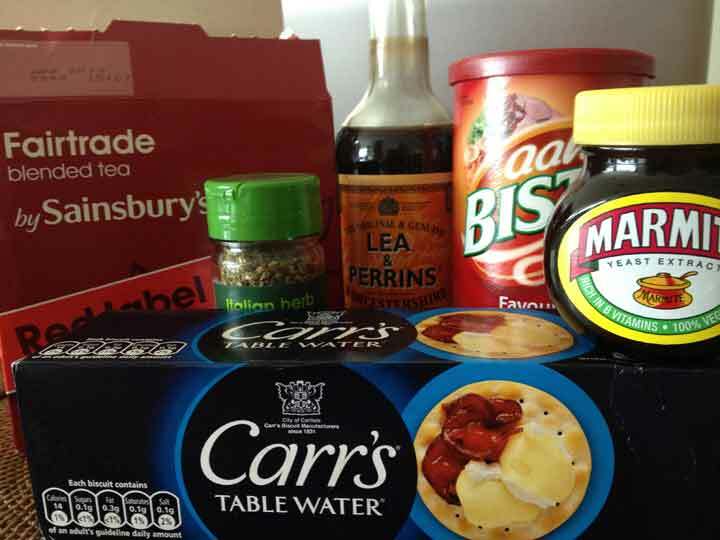 Indeed Brits are so notorious for being culinary stick-in-the-muds and wanting only familiar condiments, teabags, sauces, jams and biscuits, that there are now dedicated sections in most large French and Spanish supermarkets to keep British visitors and expats happy. Here you will find everything your British heart can desire. Birds Custard, Bourbon biscuits, Branston Pickle, Baked Beans, Bisto. …Notice how everything starts with ‘B’? but then we move on to HP sauce, PG Tips teabags, Frank Cooper’s Marmalade, Lea and Perrins Worcestershire sauce. Of course we are addicted to Heinz Tomato Ketchup as well but that doesn’t really count because it’s an American invention and not ours. For years I have turned up my nose at these gastronomically challenged folk, sneering at them as I watch them grab every last packet of custard creams off a French supermarket shelf, or demanding egg and chips with a large dollop of HP sauce in a Greek Taverna. I have sneered, and mocked and laughed at all of them, until…now. Yes, I’m about to come clean to you and admit that just very recently, I too have joined the ranks of those sad Brits who cannot live without their favourite foodstuffs when living overseas. I can’t believe that I’m writing this, I cannot believe that I am fessing up to bringing tea back to Jakarta. TEA! I hear you all shout – Why the hell are you bringing tea back to a country that grows bloody tons of the stuff? Well, the answer my friends is that in 13 months of living here, I haven’t yet found one brand of tea that I like. I’ve tried packet after packet after packet of tea and no joy – it’s just not the same, please trust me on this if, like me you prefer what we refer to in the UK as Builder’s tea. Next up, is Bisto gravy granules. My darling Mother will be turning in her grave if she knows that I use them, let alone the shame she’d feel at her daughter bringing them back to Indonesia in her suitcase. Carr’s table water biscuits – perfect smeared with Marmite and a bit of mature cheddar. Can’t find Mature Cheddar in Jakarta so it’s Dutch Gouda instead. The truth of the matter is that however much I’ve wanted to stay on my culinary high horse and only eat native whilst living here, there comes a point when you really start to crave what Irishman and I now affectionately call Normal Food. In the past year I’ve shunned the imported sauces, snacks and treats that are available in the more western style supermarkets and opted instead for Indonesian brands, doing my best to use local fruit and veg, and experimenting with different herbs and spices. The result has been interesting, but not wholly satisfactory. In our last apartment I only had a 2 ring gas hob to work with so it was mostly stir-frys that we lived on. Now that we’ve moved into swanksville on the 12th floor our culinary horizons have opened up because these days we have a working oven. Shepherd’s pie, casseroles, Irish stews, lasagna, you name it, have all been lovingly made by Mrs Nev in her new kitchen. Next time we go back to London, I shall be stocking up on other treats that we miss like Irishman’s favourite marmalade and my mint sauce, but for now just opening up the cupboard and seeing a jar of Marmite and a packet of Red label Sainsbury’s teabags on the shelf makes me inordinately happy. This was hilarious and I can really relate to everything you said. I moved from London to Taiwan this year, after 8 months I am starting to crack! Longing for a Bacon Sandwich, Marmite on Toast, Crackers and Cheese! When i moved here I confess, I did take 1 pot of Marmite! 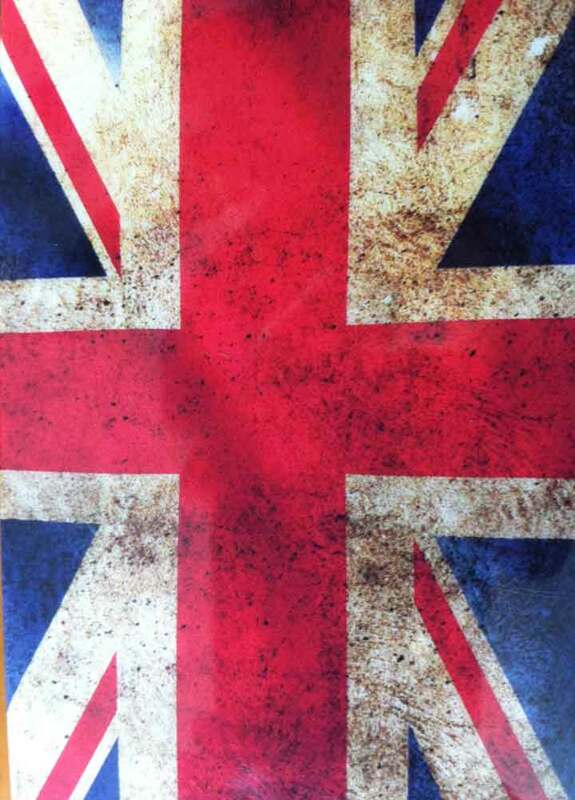 One of the best of British! Eating local is great but sometimes you need that feeling of home, no matter how much you love where you are. Thanks for your great comment, I always love hearing other peoples experiences and take on things. I didn’t realise that you are in Taiwan, that’s really cool. I totally get it, and understand your cravings -I’ve even started to dream about things like Yorkshire pudding -Yikes! I love Indonesia, and the food is mostly right up my street, but I’m sorry, nothing on this earth beats rashers of crispy back bacon sandwiched between great thick doorsteps of farmhouse white bread, lashings of butter and smoothered in HP or ketchup….oh God, I think I’m going to pass out in ecstasy!! Yes, it hits you after you’ve been away for a while doesn’t it? However snobby you are about food I challenge anyone to be away for more than a year without craving something from their home country. Marmite are sponsoring the xmas lights this year y’know. Yes seriously. I went to see the switch-on because Robbie Williams was doing it and I’m besotted with him. There was marmite everywhere. I hate the stuff. Maybe they’re trying to be like coca-cola and get the stuff associated with xmas and fun times and all that. Like the new background, btw. The white on black was too hard on my tired, old eyes. I saw the lights Sarah, so weird eh? Like I said, I can’t think what Marmite and Christmas have in common but you may well be on to something with your association idea – smart thinking lady! Glad you prefer this background, so do I. Still not entirely happy with this new ‘theme’ – might have to change it….not sure! This post was so good and funny too!. I can say that I relate when in reality I do not because I am not a traveler or a mover- don’t hanker to be one and will never be one. However, when I go to see my child in Austin, Texas, I take my soy milk, jar of honey, and frozen 7 grain muffins – not made with any sugar. Because she will not have these items and I do not want to drive to HEB 7 miles away to get the must haves. Seriously, I can not understand how one just packs up and moves so far away from home- but it is done all the time. I am a strange one. I dig these posts a lot and I am going to send my blogger friend in Canada your blog site. Maybe that is how I found you? I must see about that! I’m tickled pink (i love that expression and haven’t used it in ages) that you liked the post, and I’m well impressed with your 7 grain sugar free muffins. Very wholesome and healthsome plus the soy milk and honey and you are well on your way to becoming a ‘mobile’ healthfood store! As an ex-pat Kiwi living in Brazil and travelling in South America for 20 years there are somethings I long for, not the least decent fish ‘n chips. Although I am a chef, I cannot for the life of me recreate the Fish ‘n Chip shop article. Earl Grey tea is here and I can get Lea & Perrins Worcestershire Sauce, albeit expensive. Marmite may be scarce in NZ at the moment, but it’s like rockinghorse poo here. I used to be in the habit of taking Brazilian products back to NZ, but I have never brought Kiwi stuff back with me. Rocking horse poo! I laughed SO much when I read that! I know exactly what you mean though – as for Fish and Chips, well let’s face it, they absolutely have to be from a ‘chippie’ for starters, laden with grease, perfect batter AND preferably eaten out of a newspaper as you are walking back from the pub. It just doesn’t work otherwise. Mushy peas or curry sauce? Pickled egg? HUGE respect to you for not bringing Kiwi stuff back out to Brazil, you are a clearly a better man than I am. I’ve failed abysmally….lily livered expat that I am! I must confess that next time, if there ever is, a jar of Marmite might just fall into my suitcase. Twenty years sans… is just a bit too much sans. Kiwi F & Cs are different to the English ones, as for mushy peas God forbid… But you are right about the newspaper, adds flavour. Thanks for the visit, and the ‘like’, appreciated. I have taken the liberty of adding your blog to my renewed Blogger’s Cafe. It’s great, you have a real talent for writing. For some reason everytime I try to leave comments on Blogger sites there seems to be some Indo firewall that comes up – not sure why, it may on the other hand be me being very inept. Looking forward to reading posts, I have a feeling that they are going to be good fun and also checking out the other blogs that you have listed. So glad you like the listing, I have pasted your comment over there on your behalf. Thanks for that mention on FB, I don’t FB, but I see that quite a few visitirs came from there. I have no doubt you were responsible, thank you. One of the best ways to get your home culinary delights is to join a club. I belong to a secret squirrel club in Hong Kong (which is just as well as that is where I live) and it has several restaurants and bars that frankly could be anywhere in Britain. In the members’ bar at lunchtime there is a daily roast and things like cottage pie, bangers & mash, curry …. all seriously good quality. You can have a full English brekkie too. And once you have paid your entry fee its amazing value. That doesn’t stop people saying can you bring me back some marmite though. The stuff is available here but it is very expensive. I do think you were very brave, plucking up the courage to move to N. Yorkshire. I suspect Jakarta is more like Suffolk than N. Yorks. I have been to Suffolk and Jakarta but never NY but I was instantly struck by how alike Jakarta is to say Ipswich. The traffic jams, the the call to prayer, the corruption, the kreteks, the betel nut spitting……… I bet is was a real culture shock going to NY. And can you really get aubergines so far North? Isn’t Indonesia the place where the civet cats crap the world’s best coffee? That would never be possible in NY, would it. The climate’s crap. The civets all wear puffa jackets in Skipton. And there is no Yorkshire Archipelago as far as I know. No Kimono Dragons except for the Japanese lady who does the tea at Headingley. And language is probably less of a problem in Jakarta. I could never do Bahasa Bedale. Dropped it before I got to O’level and did Russian instead. Ah well. Must go……. I have a blog to write you know. Toodle pip.